We're counting down the number of weekends we have left this summer before hockey scoops us up and plops us in a new part of the world. Safe to say, we're trying to take advantage. 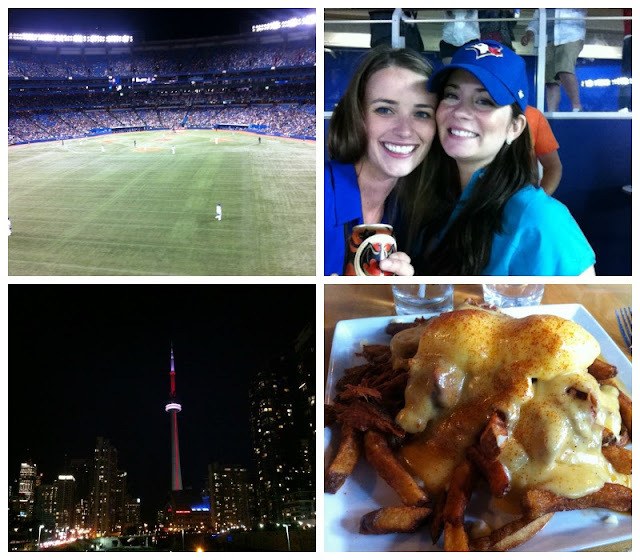 This weekend the travels left us in Toronto, where we celebrated my bigger little sister's 22nd birthday. I love this city (and obviously my little sister). Another solid weekend in the books. 4// Best hangover food: eggs benny/poutine combo. 1// Cheers to beer at the Toronto Festival of Beers. 2// Beef jerky makes me happy. 1// Foodies - poutine and lobster rolls. Happy 1 month anniversary to my hubby. I know it's not much to celebrate, but it's hard to believe that amazing day was a month ago! This summer is flying! Linking up with Sami's Shenanigans for Weekend Shenanigans. Did you two sign somewhere ??! !